Since the weather has been getting colder, I’ve been craving warm and comforting meals for dinner, and nothing fits that craving better than a steaming hot bowl of homemade soup. Before I learned how to cook, boxed/canned soup was something that appeared frequently in my meals. Fortunately, I have since learned that making your own soup at home is so easy and tastes a thousand times better than the stuff that has been sitting on a shelf for who knows how long. I’ve always loved broccoli cheese soup, but have never made it for myself. When I tried looking for recipes for it, I was a little shocked to see how much butter and cream went into most versions. I usually try to make my meals as healthy as possible when I’m just cooking for myself, and while broccoli cheese soup itself can never really be 100% healthy because cheese is an essential component, I knew I could at least find a lighter version. Fortunately, that’s where Cooking Light came in to save the day with the perfect recipe! I still made quite a few changes to their recipe: I used sharp cheddar cheese instead of velveeta (which scares me a bit) and fresh broccoli instead of frozen; I replaced the 2% milk with skim milk, which I was worried wouldn’t work but the soup still came out really thick; and I doubled the garlic and pepper and added some mustard powder for extra flavour. I also processed all of the soup at the end instead of just a third of it as the recipe suggested, because I wanted the soup to be a little smoother. The result was amazing! This soup was so cheesy, thick and comforting, and was also really easy to make. I was so amazed that a soup that is typically cream-based could still taste just as good when made with skim milk – I couldn’t even tell that it was low fat! I will definitely be making this often during the upcoming months – it’s the perfect thing to warm you up on a cold day! Heat olive oil in a large non-stick saucepan over medium-high heat. Add onion and garlic and sauté 3 minutes or until soft. Add broth and broccoli. Bring mixture to a boil over medium-high heat. Reduce heat to medium and cook for 10 minutes. In a medium bowl, whisk together the milk and flour until well blended. Add the milk mixture to the broccoli mixture in the saucepan. Cook for 5 minutes, stirring constantly, until mixture is slightly thick. Stir in pepper and mustard powder. Remove from heat and stir in the cheese until it melts. Place the mixture in a food processor or blender (in batches if necessary) and process briefly, just until the large chunks are broken down so the mixture is smooth but with small chunks (an immersion blender would also work well here if you have one). Serve immediately, topped with extra pepper and shredded cheese if desired. This soup looks delicious! Broccoli cheese is one of my favorites! Thanks :) Me too, that's why I was glad to find a healthier recipe for it! Oooh this is lovely. 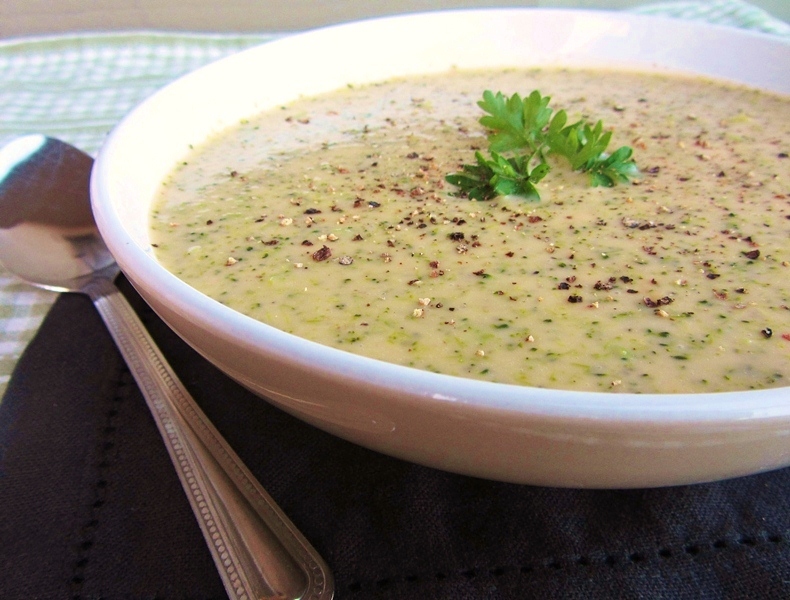 I haven't had broccoli cheese soup in a long while and this sounds even better as its low fat. Yum. Thanks again Deb, I will definitely join in again - I see lots of soups in my future with the cooler weather! Thanks! I hope you try this and enjoy it! 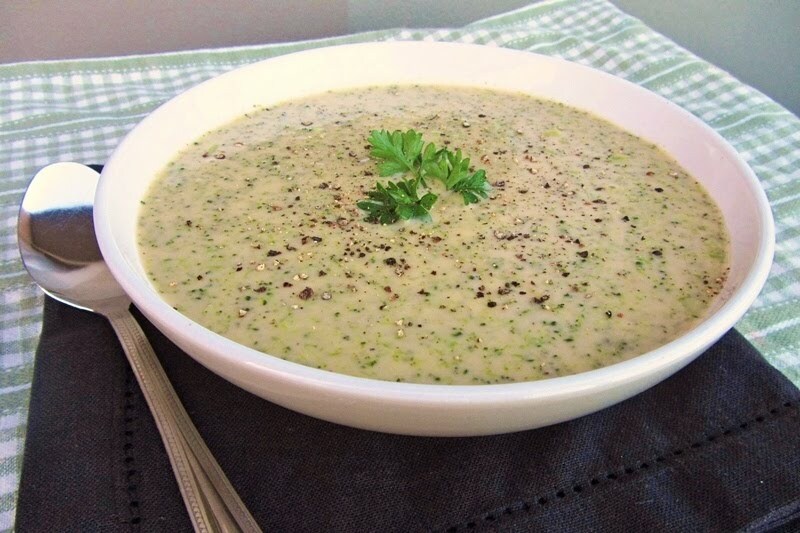 I love a yummy broccoli cheese soup, and in my book at least cheese is 100% healthy. This is delicious and easy! Wonderful on a rainy Autum day. My retired husband loved it too. Yum!